Starting in Windows 10, version 1607, some of the newer features for desktop are only available when developer mode is enabled. For information about how to enable developer mode, see Enable your device for development. Sometimes, due to network or compatibility issues, developer mode won't install correctly on your device. See the relevant section of Enable your device for development for help troubleshooting these issues. You can enable Device Portal in the For developers section of Settings. When you enable it, you must also create a corresponding username and password. Do not use your Microsoft account or other Windows credentials. Once Device Portal is enabled, you will see web links at the bottom of the section. Take note of the port number appended to the end of the listed URLs: this number is randomly generated when Device Portal is enabled but should remain consistent between reboots of the desktop. These links offer two ways to connect to Device Portal: over the local network (including VPN) or through the local host. To connet through local host, open a browser window and enter the address shown here for the connection type you're using. HTTPS is required for authentication and secure communication. 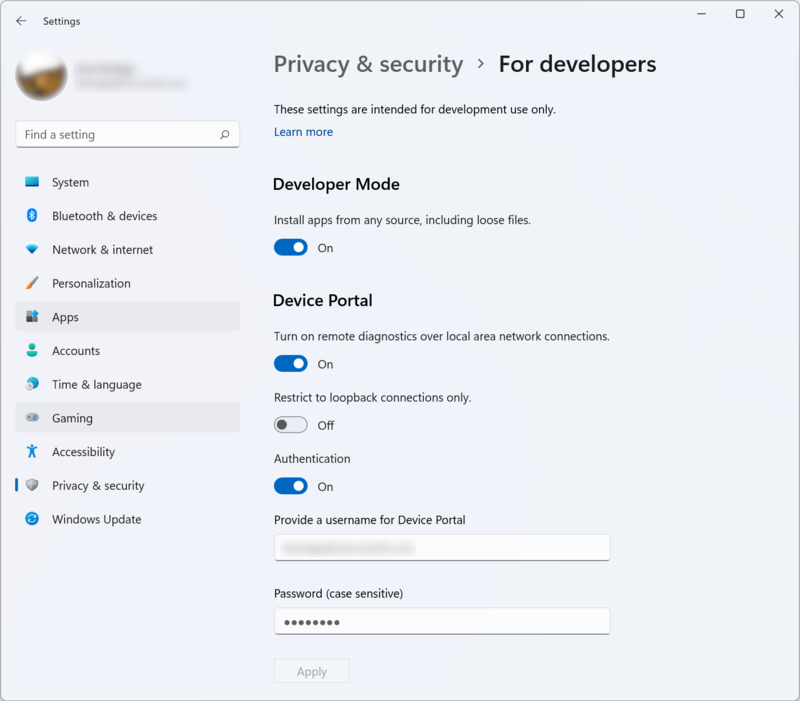 If you are using Device Portal in a protected environment, like a test lab, in which you trust everyone on your local network, have no personal information on the device, and have unique requirements, you can disable the Authentication option. This enables unencrypted communication, and allows anyone with the IP address of your computer to connect to and control it. Device Portal on Windows Desktop provides the standard set of pages. For detailed descriptions of these, see Windows Device Portal overview. UseDynamicPorts: A required DWORD. Set this to 0 in order to retain the port numbers you've chosen. HttpPort: A required DWORD. Contains the port number that Device Portal will listen for HTTP connections on. HttpsPort: A required DWORD. Contains the port number that Device Portal will listen for HTTPS connections on. UseDefaultAuthorizer - 0 for disabled, 1 for enabled. This controls both the basic auth requirement for each connection and the redirect from HTTP to HTTPS. From an administrative command prompt, you can enable and configure parts of Device Portal. To see the latest set of commands supported on your build, you can run webmanagement /? Turn the service on or off. This still requires developer mode to be enabled. Set a username and password for Device Portal. The username must conform to Basic Auth standards, so cannot contain a colon (:) and should be built out of standard ASCII characters e.g. [a-zA-Z0-9] as browsers do not parse the full character set in a standard way. This resets the SSL certificate cache used for HTTPS connections. If you encounter TLS connection errors that cannot be bypassed (as opposed to the expected certificate warning), this option may fix the problem for you. See Provisioning Device Portal with a custom SSL certificate for details. This allows you to install your own SSL certificate to fix the SSL warning page that is typically seen in Device Portal. Run a standalone version of Device Portal with a specific configuration and visible debug messages. This is most useful for building a packaged plugin. See the MSDN Magazine article for details on how to run this as System to fully test your packaged plugin. Below are some common errors that you may encounter when setting up Device Portal. Navigate to Settings > Update & Security > Windows Insider Program and confirm that the Windows Insider account section has your correct account info. If you don't see that section, select Link a Windows Insider account, add your email account, and confirm that it shows up under the Windows Insider account heading (you may need to select Link a Windows Insider account a second time to actually link a newly added account). Under What kind of content would you like to receive?, make sure Active development of Windows is selected. Under What pace do you want to get new builds?, make sure Windows Insider Fast is selected. You should now be able to install the FoDs. If you've confirmed that you're on Windows Insider Fast and still cannot install the FoDs, please provide feedback and attach the log files under C:\Windows\Logs\CBS. You may get this error if the developer packages aren't installed. Without the developer packages, there is no web management service. Try installing the developer packages again. You may get this error if you're on a metered internet connection. You won't be able to download the developer packages on a metered connection.